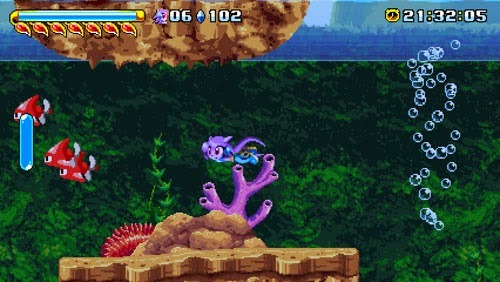 A game by GalaxyTrail for PC, Mac, Linux, Wii U, and Switch, originally released in 2014. 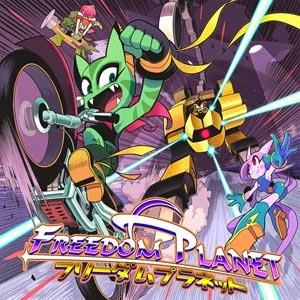 Freedom Planet is a game that wears its 16-bit platforming heritage proudly, with cheerful character designs, a brightly colored world, varied level themes, charming and silly humor mixed with occasional melodrama, and an upbeat throwback soundtrack. 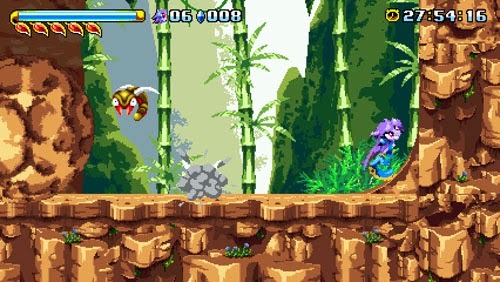 The game’s design and color scheme bring it in line with 16-bit classics like Ristar, Rocket Knight Adventures, and especially Sonic the Hedgehog. The game also features fully voiced cutscenes in Adventure Mode, something that wasn’t possible for cartridge-based systems of the 16-bit era (although Classic Mode switches this off for 16-bit purists), giving the game a feel more along the lines of something on the Sega CD. 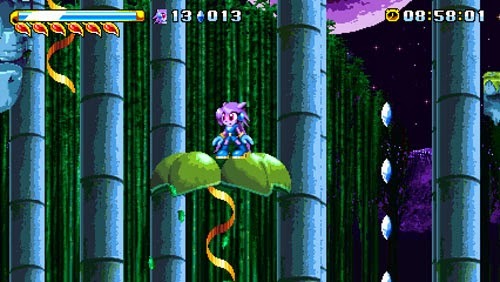 Freedom Planet originally got its start as a Sonic fan game, complete with spinning rings, Sonic’s trademark sound effects, and a planned appearance by Dr. Robotnick. 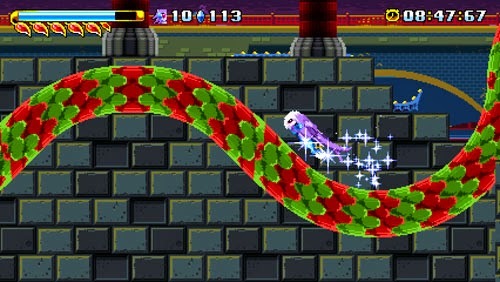 However, as the developer created more new and original content for the game, he decided to make it into something that would stand on its own, while retaining a number of homages to Sega’s classic series, including a mixture of speed- and exploration-based gameplay, a world populated by wide-eyed anthropomorphized characters, and loads of curved surfaces. The end result is a game that looks and feels like something that could belong to the world of the Blue Blur, while offering its own unique gameplay elements, story, and style that set it apart from the Sonic series. The game begins with an alien ship crash landing in the night, and a large red-eyed alien emerges and clenches his fists in frustration… It’s not long before the alien – who calls himself Lord Brevon – puts his superior technology to use in a bid to take down the world’s greatest power and steal their energy source, known as the Kingdom Stone. After beheading the king in front of his own son, Brevon converts the prince into a minion of his own, commanding him to send out his army and steal energy from the neighboring lands so that he can rebuild his damaged ship and continue on his mission to take over the galaxy. 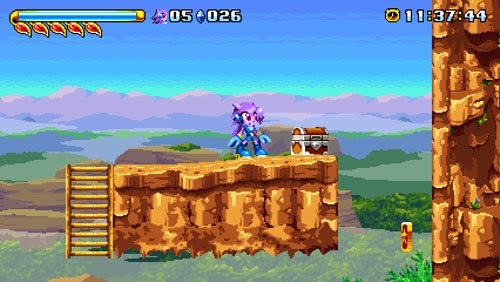 Of course, it’s not long before a few plucky heroes get involved in the world’s plight and find themselves at odds with the greatest military powers in the land… After the introductory cutscene, the player is given the choice to select between two playable characters: Sash Lilac and Carol Tea. 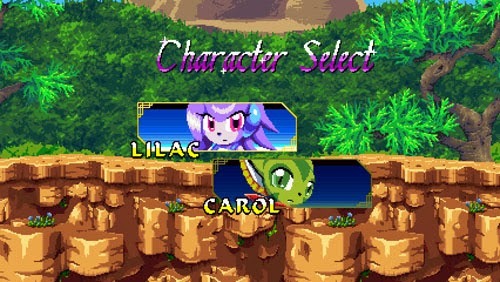 Lilac is a lavender half dragon, while Carol is a green wildcat. The characters share a 2x variable jump and short range melee swipes, as well as a special meter that recharges over time, but beyond this, their movesets are very different. Lilac’s basic moveset allows her to whip enemies with her hair and perform a low ducking attack, an uppercut, and a dive kick. 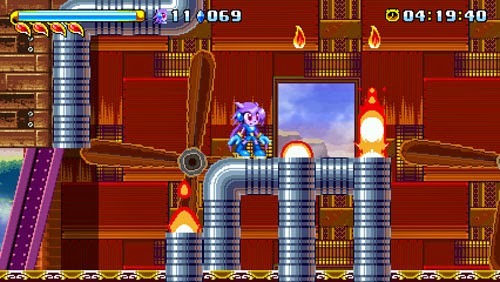 With a fully charged special meter, Lilac can burst forward with great speed, allowing her to rocket through the environment and take advantage of sloped surfaces to reach great heights. 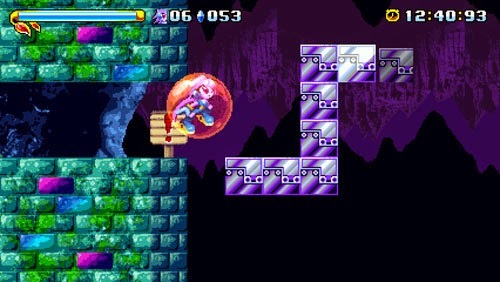 Lilac can also perform a boost dash in midair to send herself bouncing up through narrow passageways at 45 degree angles a la Sparkster. In addition, she has a cyclone spin maneuver that can be used with even a partially-charged special meter. This allows her to slow her descent and reach greater distances, reach slightly greater heights, and deal some fast but weak attacks to airborne enemies. Carol has faster attacks but they are weaker. And, rather than a dash maneuver, Carol’s special ability is a high-speed Chun Li-style kick that lasts for as long as the player holds the ATTACK button, and until the meter is drained. Unlike Lilac, Carol can duck and jump in order to roll into a ball in traditional Sonic style and roll down sloped surfaces. Spread throughout many environments are gas cans that Carol can pick up to summon her motorcycle. 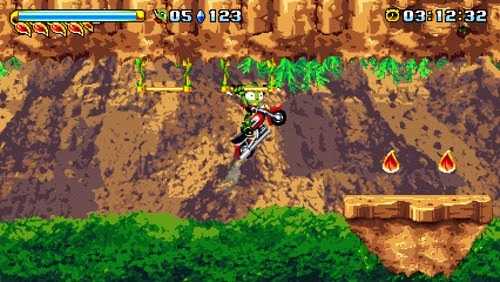 The motorcycle allows Carol to move more quickly, and it can even be used to drive straight up walls, but it can only sustain a few hits before being destroyed. Carol can still perform most of her regular environmental navigation abilities while riding the motorcycle, including climbing up ladders (or rather, driving up them) and hanging from bars… at which point she has to sustain the weight of the machine with a humorous stressed look on her face. 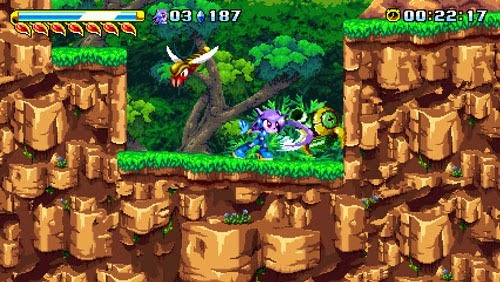 Early into their adventure, Lilac and Carol meet a doglike critter named Milla Bassett, who has an entirely different set of movies, but she is only available to play in Classic Mode (although the developer plans to release an update that makes her playable in Adventure Mode as well, along with a couple of other characters). Milla has a shorter life bar and doesn’t have any direct melee attacks. 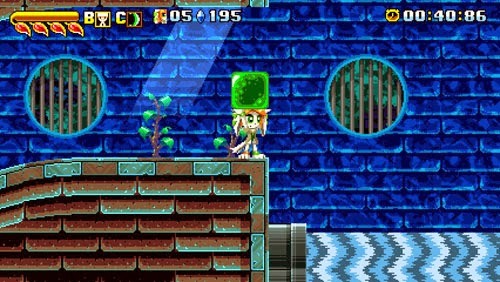 Instead, she is able to summon green blocks that she can hold over her head and toss at nearby enemies, and she can also pick up other objects in the environment and throw them as well. In addition, Milla has an energy shield that she can use to block projectiles, and her special move allows her to fire off an energy beam. 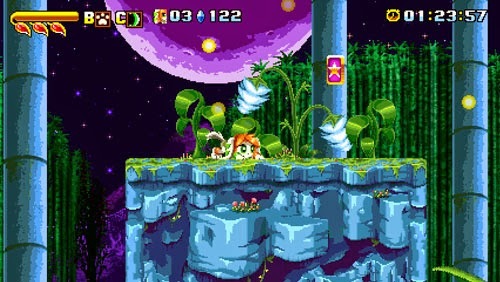 Milla is a bit slower when navigating the environment, but holding the JUMP button while in the air allows her to flap her ears and hover to reach areas that the other characters cannot. In fact, each of the characters’ abilities gives them certain advantages when navigating the environment. 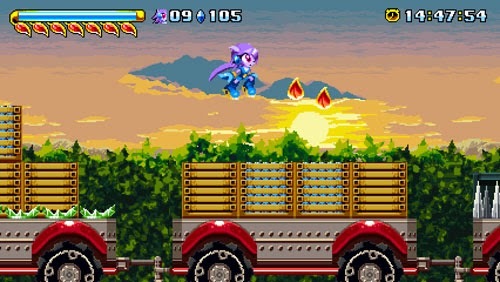 For instance, Lilac’s dash maneuver can be used to break through walls, and Carol’s ability to wall jump or drive her motorcycle straight up walls allows her to reach greater heights than Lilac, who can only run upwards until she runs out of steam. 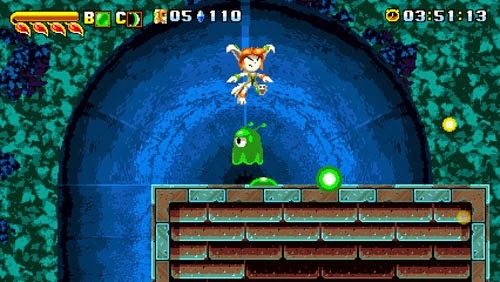 In addition, Carol can access special red platforms that allow her to jump from one to the next – with the proper timing – to reach out-of-the-way areas, potentially leading to health restoratives, collectible cards, 1UPs, or any number of colored crystals that offer temporary invincibility or a variety of shields. In addition to protecting its bearer from attacks, each of the color-coded shields has a different secondary effect, including minor health restoration, the ability to pull in nearby crystals, and immunity to certain elemental effects. The blue shield even allows the characters to breathe underwater, making it very valuable – and, in one instance, required – to pass through extended sequences where characters find themselves swimming through submerged areas. Another collectible comes in the form of element-themed orbs, which seem to be of particular interest to a character named Torque, who is a self-described “shellduck”… a sort of duck/turtle hybrid. In earlier builds of the game, these elemental orbs could be collected to gain a shield with that particular elemental affinity. In the final game, however, they are only used in a dice rolling minigame that occurs between levels (if you found a certain yin yang medallion beforehand), allowing you to start the next level with a random shield type. In its classic progenitors, finding 1UPs was necessary for progression, as losing all of your lives sent you back to the beginning of the stage, or – in many cases – back to the beginning of the game. Modern games, on the other hand, tend to give players unlimited lives with a minor loss in progress as the primary penalty for failure. 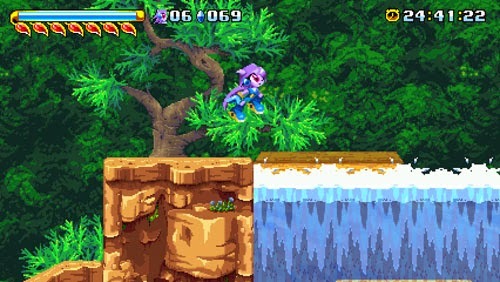 Freedom Planet, on the other hand, gives the player a limited stock of lives and offers out-of-the-way 1UPs that players would expect to find in a game of this nature, but it also offers unlimited continues. 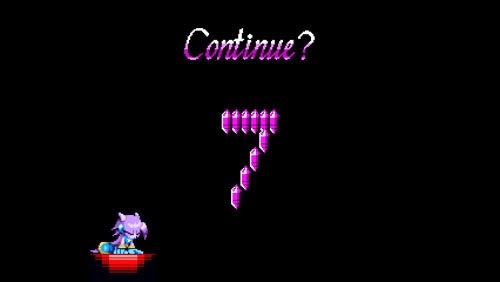 And, rather than starting the player back at the beginning of the stage, losing all of his lives simply returns the player to the last checkpoint with five more lives in stock… thus performing a function equivalent to granting unlimited lives. There are even instances where getting killed during a boss fight will return you to the start of the last phase, rather than to the start of the boss fight. This, in turn, devalues the act of collecting the game’s primary pickup (crystals), as they serve no additional gameplay function other than potentially leading the player down a path toward some greater reward. Additionally, there are numerous instances where level designs encourage players to struggle to make their way up to some out-of-the-way platform, only to be rewarded with a 1UP that essentially serves no purpose. 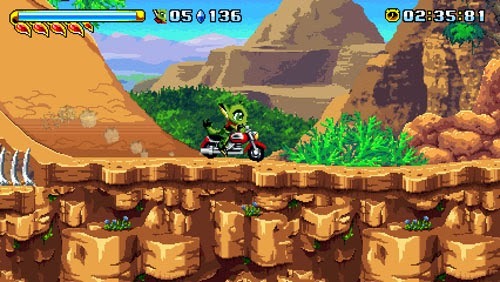 The game offers 10 worlds – although a couple of them are character-exclusive – followed by an extended multi-level final sequence leading to the game’s end boss. Each of the levels has a different theme, many of which are classic platformer staples, including pastoral plains, ancient ruins, a city at night, a bamboo forest, a frozen tundra, and a couple of enemy bases. While most levels feature a generally left-to-right progression, one interesting area takes place on an airship that is under attack from a number of other airships. By activating various plungers spread throughout the environment, the airship launches a series of (wooden!) missiles at a nearby ship of the player’s choosing. 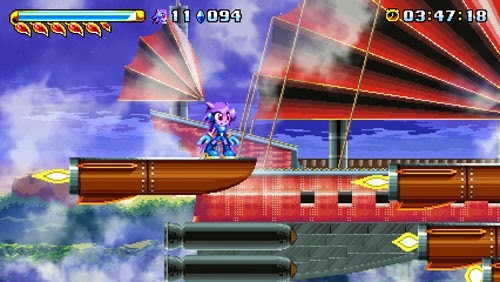 The player then runs along these missiles and boards the enemy airship – each of which has a different elemental theme – and runs through the level, eventually reaching a set of cannons that must be disabled. At that point, the player character hops into the seat of a plane that is being flown by Torque, who flies you back to the main airship and allows you to repeat your attacks on two more ships before facing the end-level boss. 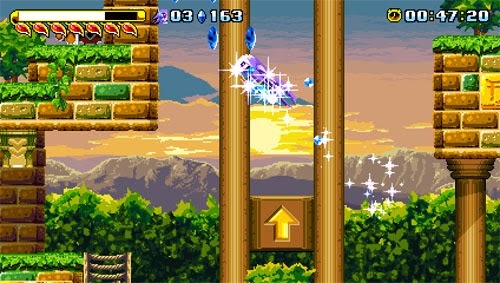 New gameplay elements are introduced during many of the stages, including giant dandelion seeds that can be used as gliders, challenges where players must hold onto a bar to swing around and fling themselves high into the air, a number of underwater sequences, and lots and lots of speed-based areas where players are rewarded for running all-out. One late game area introduces spinning blue rings. 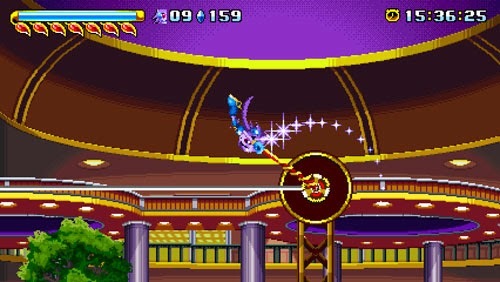 Passing through a ring grants the player a short range projectile attack, but also – more importantly – instantly refills the player’s special meter. This opens up a number of complex ricochet sequences where the player must bounce up through narrow passageways, pass through a ring while in midair, and then initiate another dash before falling back down. 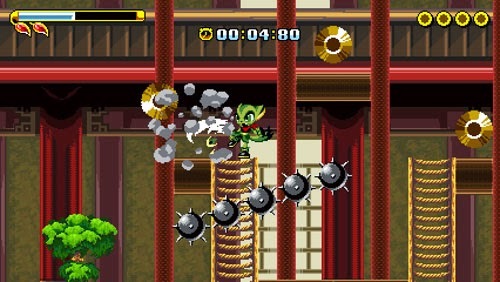 The game features loads of floating platforms and curved surfaces, offering numerous opportunities for skilled players to rocket into the air to reach hidden areas or access higher platforms. 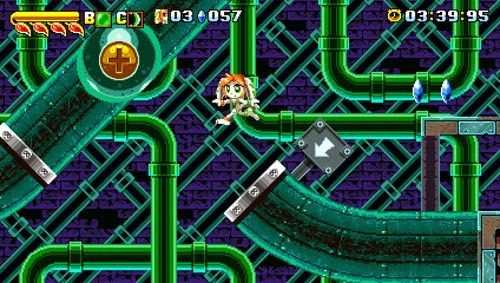 Most of the standard Sonic the Hedgehog set pieces make an appearance, including half pipes, loops, lengthy wall-running sequences, and two different kinds of spring loaded bumpers to send characters flying off in a given direction (although the lack of a traditional “roll” function means that the bumpers don’t operate in quite the same way). Along the way, the player faces off against a number of enemies that may be engaged in melee combat. This is in direct contrast with many other platforming games of the 16-bit era, in which coming into contact with an enemy would kill or cause damage to the player character, and enemies could be defeated with a single bop on the head. 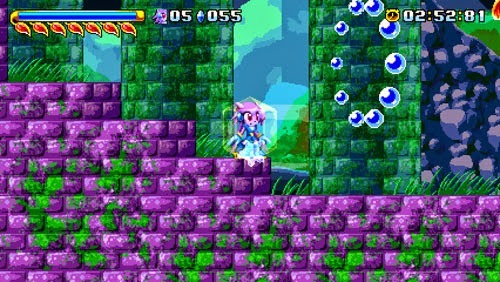 This design decision also alters the pace of the game somewhat, as players may run freely through enemies without taking damage. 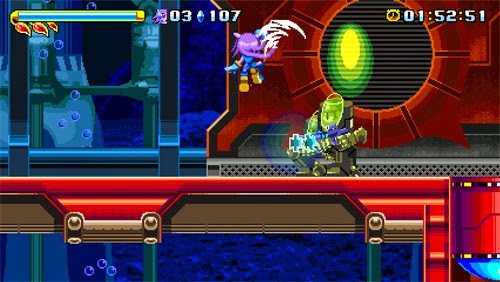 In addition, most enemies take several hits to destroy, opening up the player to incidental damage from the engaged enemy or its nearby cohorts. This change in design is supported by a lengthy life bar that allows player characters to sustain up to 14 weak hits before being killed. Health restoration comes from collecting “life petals” that are spread fairly liberally throughout the environment (although this is undermined somewhat by the game’s unlimited continues), and these sometimes make limited appearances during boss battles. Each petal restores a half-unit of health. 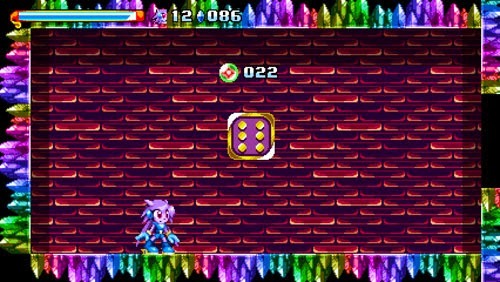 Each level features multiple mini-boss encounters, some of which are required to unlock certain color-coded doors in order to proceed further into the level. And, of course, the player faces off against a number of gigantic pattern-based end bosses with specific weak points. 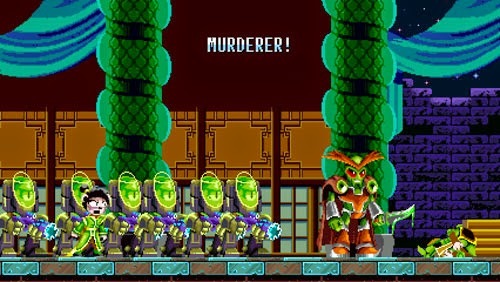 Some of these bosses have attacks that can drain half of the player’s health bar in a single hit, which may lead to a few quick deaths before the player fully appreciates the boss’ patterns and telegraphs. While the game superficially appears to be a direct facsimile of the Sonic experience, a number of design choices separate it from its spiritual ancestor, while still paying homage to the classic series. The game’s design requires a more technical approach to the levels and tends to reward exploration over speed, virtually eliminating sequences where the player can just run at full speed and watch the world fly by. The choice to use melee combat in a platforming world also changes the player’s approach to enemies and boss encounters, as a traditional bop-and-run approach is not an option here. 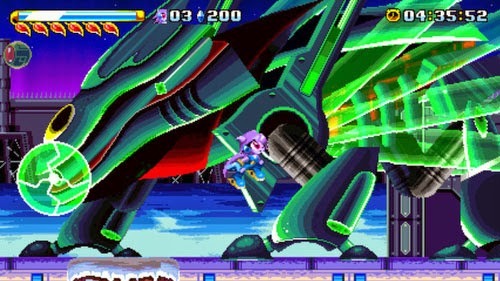 Freedom Planet was developed by GalaxyTrail, which was founded in 2011. 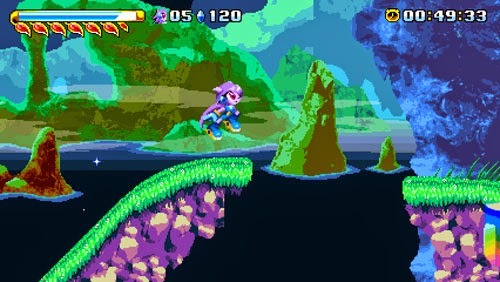 GalaxyTrail was originally a one-man studio headed by Nordic developer Stephen “Strife” DiDuro, who started Freedom Planet as a Sonic the Hedgehog fan game that also paid homage to a number of other classic action titles of the era. In 2012, the studio expanded to a team of about 20 people, and in 2013, the studio successfully funded the game via Kickstarter.